How to retrieve a deleted text message on iPhone? How do I retrieve a deleted text message on my iPhone? Do you want to retrieve deleted text messages from iPhone? How to recover iPhone deleted text messages? Don't worry. Solutions are shared here to get back deleted text messages on iPhone. So how to retrieve a deleted text message on iPhone? It is quite easy to delete some important data like text messages, contacts, notes, etc, from iPhone by accident. Usually, when it comes to data loss problem, most people will think of restoring from iTunes or iCloud backup if having a backup file for deleted data. However, the question is when restoring from iTunes or iCloud backup directly, you will get back iPhone deleted text messages, meanwhile, other data on your iPhone will be erased by data from backup, which also is a troublesome problem. So can you recover a deleted text messages from iPhone directly? Or can you retrieve iPhone deleted text messages from backup selectively? Keep reading. With or without any backup for those deleted text messages, you can always retrieve them back as long as under the help from iFonebox, which is a professional iPhone message data recovery tool to retrieve deleted or lost text messages, contacts, notes, wechat messages, etc, from iPhone or iPad directly. Also, if you have an iTunes or iCloud backup for lost data, iFonebox is your best choice to extract and restore lost data you need from backup selectively, without erasing any data on your iOS device. Plus, iFonebox enables you to transfer recovered text messages back to your iPhone directly, like contacts and notes. So cool. 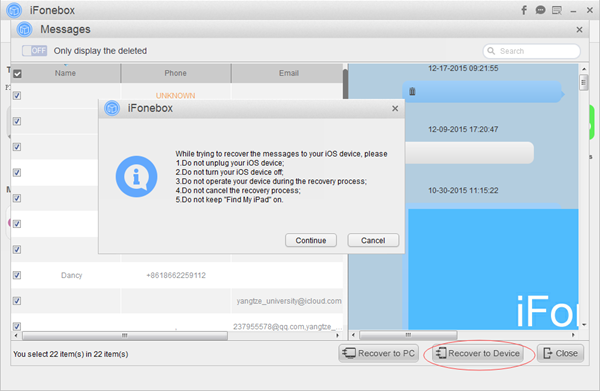 Undoubtedly, it is necessary to download and install iFonebox on your computer so as to recover iPhone deleted text messages. There are two versions accessible: Windows version and Mac version. How to retrieve deleted text messages from iPhone directly? Launch iFonebox. Choose Recover from iOS Device mode. Please connect your iPhone to the computer with USB cable so as to scan and retrieve messages back to it. Once connected successfully, your iPhone will be detected by iFonebox. Click Start button to begin. How to retrieve deleted text messages from backup selectively? If you have an iTunes or iCloud backup for those deleted text messages, you can also extract and restore them from backup selectively via iFonebox. Here, I will take iTunes backup as example. Run iFonebox. Choose Recover from iTunes Backup mode. 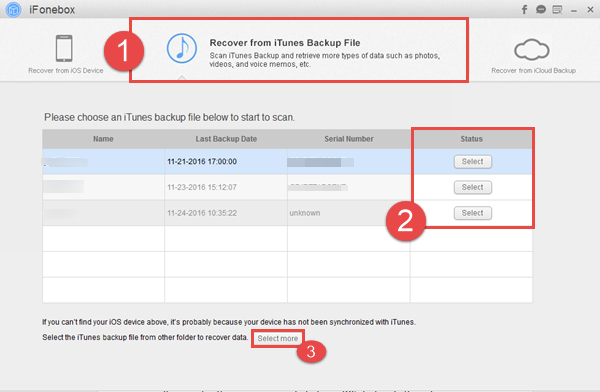 You can select one iTunes backup file containing your deleted text messages to scan. Bear in mind to connect your iPhone to the computer so as to recover lost messages back to it. Scan messages from selected iTunes backup. Click on Messages item to begin the automatic scanning and analysis process. Preview and select lost messages to recover. Now you have the chance to view and select deleted text messages from iTunes backup. If you want to restore lost text messages from iCloud backup selectively via iFonebox, just sign in with your Apple ID and password to download iCloud backup. In short, it is quite convenient to retrieve deleted text messages from iPhone under the help from iFonebox.